Place unpeeled arbi in a saucepan and cover completely with cold water. Place on a gas range and bring it to simmer. Simmer for 30 to 40 minutes or till the tip of a small knife inserted into one of the arbi goes in easily. Remove from gas and drain the water. Allow to cool slightly. Oil your hands lightly and peel the skin using a small knife. Keep aside in a bowl. In a plate mix together mustard oil, ajwain, chilli powder, turmeric and salt. Flatten each arbi slightly and place in the masala mix. Turn over to coat both sides evenly. Using pre-soaked bamboo skewers pierce each arbi to give it a lollipop shape. 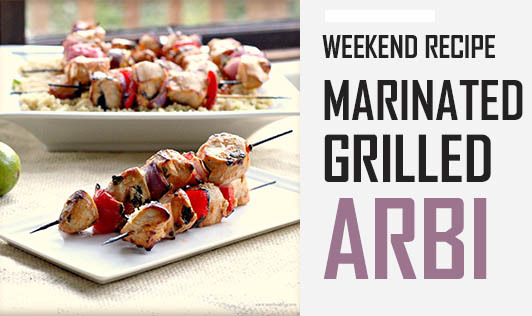 On a medium heat charcoal grill place an 8 inch by 12 inch piece of aluminium foil and place the skewer on the foil with the arbi touching the exposed grill. This will prevent burning of the skewers and give you a nice presentation. Cook on both sides for about 2 minutes each side, uncovered. Take off the grill and squeeze fresh lemon juice on it. Serve at once with some raita.